NASA’s MAVEN spacecraft celebrates four years in orbit studying the upper atmosphere of the Red Planet and how it interacts with the Sun and the solar wind. To mark the occasion, the team has released a selfie image of the spacecraft at Mars. 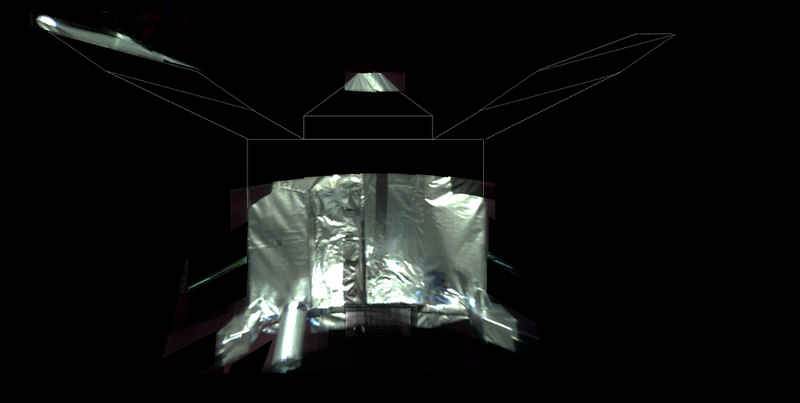 MAVEN has obtained a selfie image, looking at ultraviolet wavelengths of sunlight reflected off of components of the spacecraft. The image was obtained with the Imaging Ultraviolet Spectrograph (IUVS) instrument that normally looks at ultraviolet emissions from the Martian upper atmosphere. The IUVS instrument is mounted on a platform at the end of a 1.2-m boom (its own “selfie stick”), and by rotating around the boom can look back at the spacecraft. The selfie was made from 21 different images, obtained with the IUVS in different orientations, that have been stitched together. The mission launched on Nov. 18, 2013, and went into orbit around Mars on Sept. 21, 2014. During its time at Mars, MAVEN has answered many questions about the Red Planet. Acquired compelling evidence that the loss of atmosphere to space has been a major driver of climate change on Mars. Determined that the stripping of ions from the upper atmosphere to space during a solar storm can be enhanced by a factor of 10 or more, possibly making these storms a major driver of loss of the atmosphere through time. Discovered two new types of Martian auroras – diffuse aurora and proton aurora. Neither type has a direct connection to the local or global magnetic field or to magnetic cusps, as auroras do on Earth. MAVEN has made direct observations of a metal-ion layer in the Martian ionosphere, the first direct detection on any planet other than the Earth. The ions are produced by a steady influx of incoming interplanetary dust. Demonstrated that the majority of the CO2 on the planet has been lost to space and that there isn’t enough left to terraform the planet by warming it, even if the CO2 could be released and put back into the atmosphere. Next year, engineers will initiate an aerobraking maneuver by skimming the spacecraft through Mars’ upper atmosphere to slow it. This will reduce the highest altitude in MAVEN’s orbit to enhance its ability to serve as a communications relay for data from rovers on the surface. Currently, MAVEN carries out about one relay pass per week with one of the rovers. This number will increase after NASA’s InSight mission lands on Mars in November. MAVEN completed its primary mission in November 2015 and has been operating in an extended mission since that time, continuing its productive investigation of Mars’ upper atmosphere and exploring additional opportunities for science that the new relay orbit will bring.